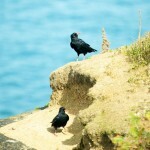 Choughs fly again in Jersey! Well, Wednesday afternoon (28th August) was rather exciting/stressful. We planned to open the shutters at the Sorel aviary to the outside world for 30 minutes at 1700. This first step should be considered part of the training for the birds rather than an ‘official’ release. The idea is that the birds get a few minutes outside each day with the access time lengthened slowly until the birds are left completely at liberty. While the birds may or may not choose to go out of the aviary they will be called in again after 30 minutes and shut inside again. This soft-release process will be repeated daily until late-September when the birds may remain at liberty unless specifically called back in (they will be fed daily and watched closely for the foreseeable future whatever happens). The first opening of the hatches was not made into an event, mostly because something could have gone wrong or, much more likely, they would not actually go out at all on the first day. The shutters were duly opened at 1700 and we had 30 minutes of ‘freedom’ and three birds wandered outside. One chough flew round a bit but not far from aviary and came in when called. Not a bad start! The birds behaved very well and the value of training and Liz’s hard work were obvious. 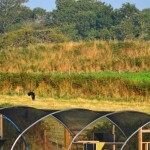 Target platforms have been put up outside of the aviary to give the birds their own and recognisable perching spots outside the aviary. Listen to BBC Radio Jersey’s Tori Orchard interview with Glyn Young on the morning of the first ‘release’ (it’s also No 7 in the series of Tori’s interviews here). The ‘release’ process was repeated today when four birds ventured outside including ‘senior pair’ MV and PG. One bird, RD, failed to grasp the idea of the entrances and failed to find its way back inside and spent all night on the aviary roof before going back inside early on Friday morning. 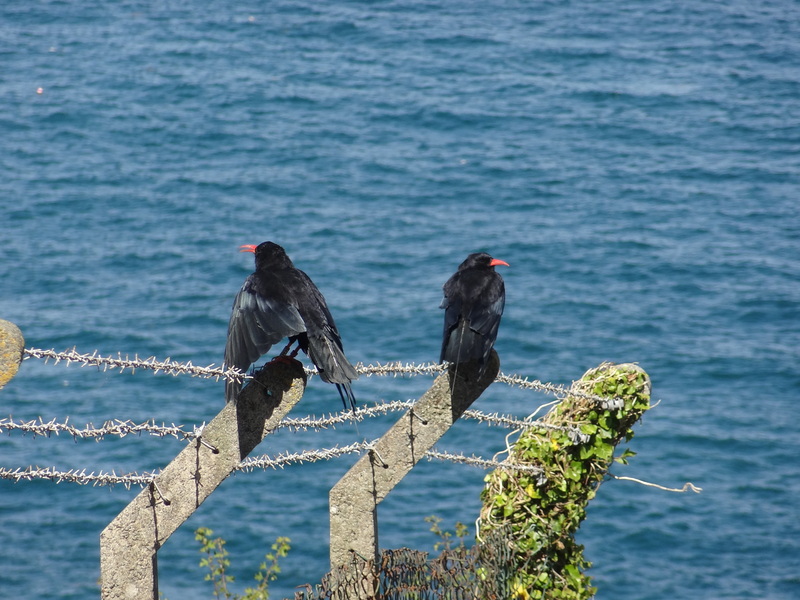 Day 3 (30th August) – the day we discovered that choughs have minds of their own! The senior pair (well, they are two years old) ventured rather further afield today and decided to explore nearby Ronez Quarry. There was a heart-in-mouth moment when we watched a peregrine attack the pair but they recognised the threat and, in mid-air, on the longest flight of their lives fought it off – during the attack the falcon grabbed one of the chough pair by the legs but let go pretty quickly. One chough went to ground to avoid the persistent falcon but the pair were quickly re-united and seemed unfazed. That’s the first peregrine encounter out the way, let’s hope that any more have the same outcome. 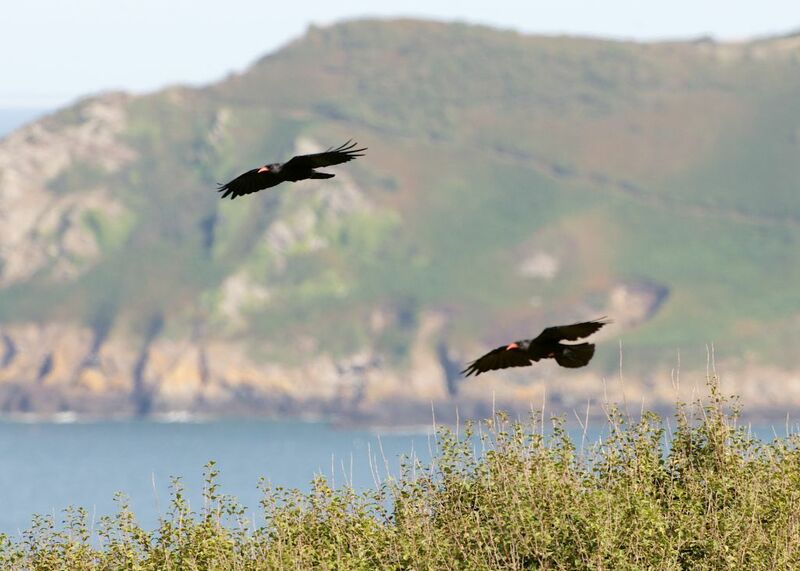 While we can observe the choughs directly, allowing us to follow their activities and check on their wellbeing, the radio transmitters allow us to track the choughs at all times. On Friday the pair moved around confidently, foraged on the ground, displayed, flew out over the sea, perched on a woodpile and generally behaved like ‘wild’ choughs. 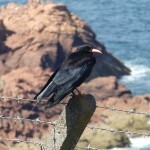 We quickly learned that the choughs and the local carrion crows just ignore each other now that they can really meet. The radio tracking team went into action and have, over the weekend, recorded the pair’s locations following a research protocol devised in advance. Having said that, the pair have at times been very visible and have appeared over Sorel Point and around the car park. Often they call loudly. On Friday night the now christened Ronez 2 slept inside one of the quarry’s conveyor belts! They were up early Saturday morning and have continued to put on a good show. Never once have they gone near the aviary even though we know they’ve been able to see it when flying up high. The pair have once more encountered falcons and were seen to actively mob them. The free-flying pair seems quite happy in and around the quarry and slept again in or near the conveyor. Wild choughs regularly live in quarries, including in North Wales, the ancestral home of our birds (see video of choughs in a quarry here). There is water in Ronez Quarry, secure roost sites and, hopefully, lots of foraging opportunities and respect from the quarry owners and personnel. The pair has been seen regularly on the grass at Sorel Point. Even with the Ronez 2 out and about, we will continue the slower soft-release of the other five birds but are wary that they have temporarily lost the presence of their senior members. Well, lost them unless they go and re-join them in the quarry! Now that there are birds out on the coast, please don’t hesitate to send in your sightings. Check here for details. We are very grateful to the team-members who have assisted us in observing the release. Alison and Ray Hales from Paradise Park (Operation Chough) have been watching the birds with us all weekend. Mike Stentiford, the project’s staunchest supporter from when it was first imagined was there for the first opening. 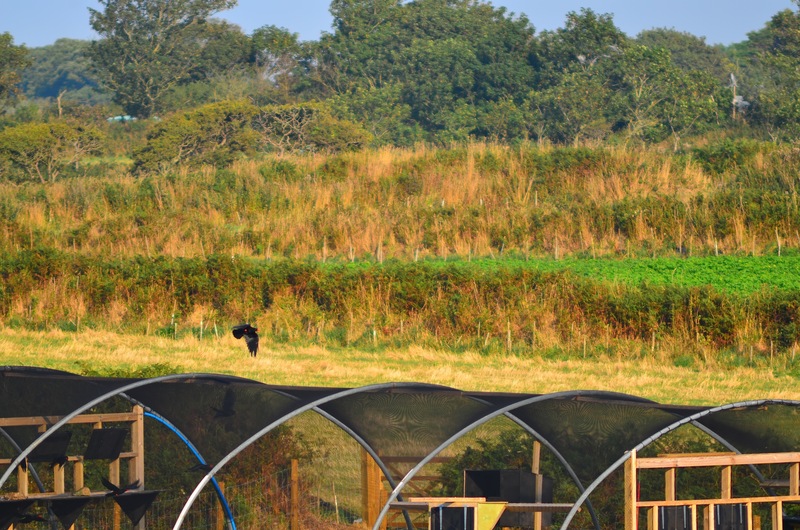 We must also give sincere thanks to Ronez Quarry who may get to see a lot of the choughs and of us! brilliant news… Well done Glyn, Liz and everyone else on the Project. 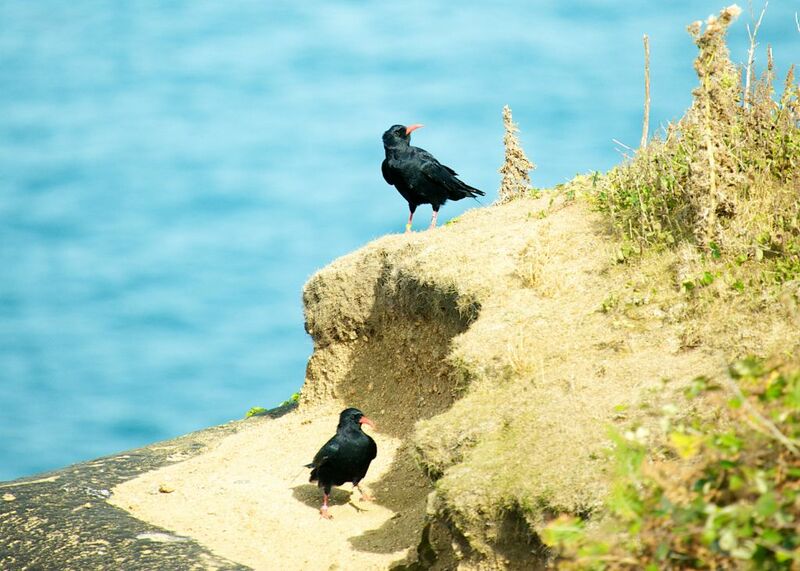 Congratulations…it’s exhilarating to see your Choughs ‘out in the wild’……but heart-stopping as well…as they face their ‘new world’! Well Done Liz, Glyn and the rest of the team. Coongratulations everyone, I hope that the birds are successful. I think that the way you have told about this project and its various aspects has been so interesting, I really look forward to reading the updates when I get them! As a local I am pleased Jersey Tourism still pour millions of pounds in Jersey Zoo and other conservation projects like this including the exciting new bird hide in St Ouens to encouraged disabled naturalists access to our huge diversity in wildlife including the native Choughs which still visit Guernsey from the French mainland where they are abundant including about 100 pairs on Brittany which have visited Les Landes and Guernsey with Raven from the Continent which provide food for any large predators which continue to visit us including Harriers and the occasional large raptor such as Short-toed Eagle with other Eagles including White-tailed Sea Eagles which are regular winter visitors to Normandy and Brittany which are now breeding in northern France speadding their breeding range towards us which we could assist colonising us next as raptors move in to our islands on a migratory superhighway we are now of International importance to birders and naturalists due to a wise investment of millins into Jersey Zoo who assist in local conservation projects including the new exciting bird hide and new local conservation initiatives. 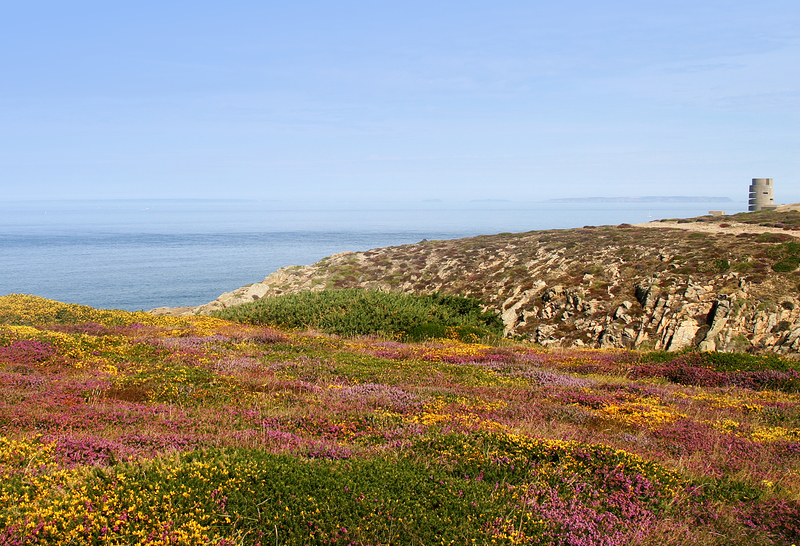 Birds On The Edge has received funding from several sources through the three partners; however, none has come directly from Jersey Tourism. 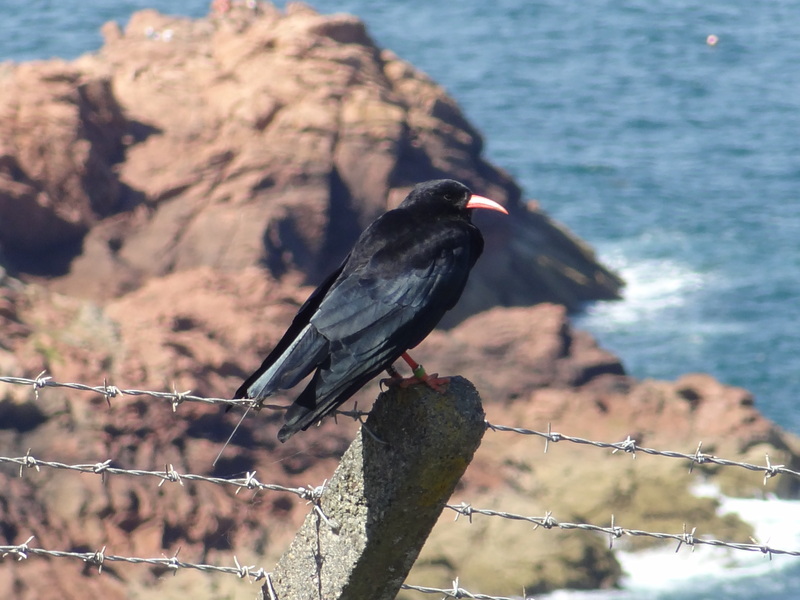 For interest, the last reported wild choughs in the Channel Islands were in Jersey (1987), Guernsey (1990) and Alderney (1991). There is an unconfirmed sighting from Sark in 2008. Red-billed Chough on Cap Frehel near Saint Malo in Brittany wearing colour rings fitted in Brittany in breeding sites have turned up as far away as Cornwall and on Ile d’Yeu in the Vendee proving Choughs breeding in Brittany can turn up on offshore islands like Jersey a short flight for corvids like Rook, Raven and Hooded Crow or Nutcracker from the French mainland where birds able to navigateusing infrasound of low level sound waves caused by crashing waves on offshore islands can be used to help birds like migratory Doves and pigeons to navigate over Jersey on a migratory corridor used by birds like Woodpigeons in hundreds of thousands to Iberia from Scandinavia and Turtle dove like radio tracked birds tracked to Mali from the UK.